Author(s): Hajime Matsui, Henry Johan, Tomoyuki Nishita. Proceedings: Computer Graphics International (CGI'05), pp. 148--154, New York, June 22-24, 2005. A lot of Non-Photorealistic Rendering methods have been proposed for creating an artistic image from an image. 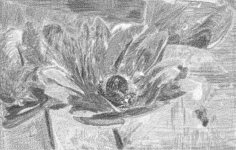 In this paper, we propose a method for creating colored pencil style images. The feature of colored pencil drawings is that, though colored pencil drawings are drawn with limited number of colors of pencils, we can express a lot of colors and gentle textures by changing the strengths when drawing strokes and by overlapping strokes of different colors. In order to realize this feature, we determine which colors of pencils to use and how deep to push the pencils (equivalent to the strength when drawing strokes), then draw several types of strokes, such as strokes for outlines, basecoats, and shading, allowing the strokes to overlap each other. When we create strokes for shading, we make their directions to align along the boundaries of regions, resulting in images that are more like drawings made by human.